When you took dive lessons you learned to perform specific skills to make you safe and comfortable underwater and at the surface. One of those skills was Buoyancy Control. Once you start diving for fun you use your Buoyancy Control Devise constantly throughout the dive. Your Octopus or Alternate Air Source Devise on the other hand is never used unless there is an Emergency Out of Air Situation. Reacting properly in an Out of Air Emergency can make the difference between a Safe Dive and a Tragedy. If your Alternate Air Source and your BCD Inflator Devise are one and the same you will always know where to find it in an emergency. The SS1 is the newest and most sophisticated product of its type, taking the concept to new levels of Convenience, Reliability and Performance. It contains a High Flow Second Stage that performs on the same level as many High Performance Second Stages. 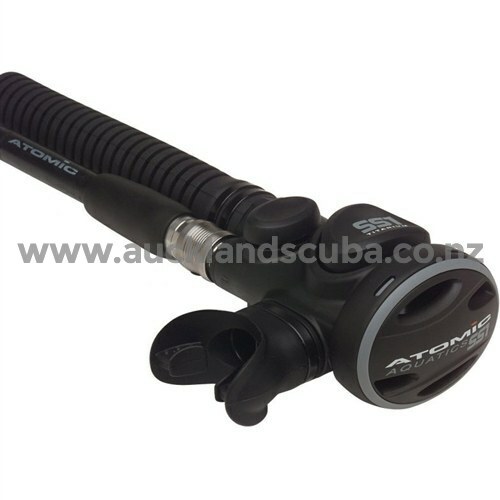 It will deliver High Flow Rates to a Diver at Depth with a Minimum of Effort. It is, however very Stable and not prone to unnecessary Free-Flow or Leakage from Water Movement while Swimming, or during Entries or Exits. The Inflator/Deflator is Easy-to-Operate with Soft-Surfaced Buttons placed where they can be Easily-Operated with One-Hand. One of the most unique features of the SS1 is its Adaptability to almost any BCD Atomic has designed a Set-of-Adapters (patent pending) to fit virtually every poplar BCD brand available. The Adapters also include components for attaching the Cable Exhaust feature of your existing BCD (if applicable). The SS1 features a Quick Disconnect not only on the Low-Pressure Hose, but the BCD Hose as well. The Adapters that fit the SS1 to the BCD are connected to the SS1 with a Threaded Collar that can be easily Unscrewed-to-Detach it completely from the BCD. Now you can carry or store the SS1 with your Primary Regulator and Gauges (patent pending). The SS1 combines the functions of the Inflator and Octopus Regulator into a Single Unit. This Reduces-the-Overall Bulk and Weight of your Dive Gear; Eliminates-Hoses, and places your Back-Up Regulator in a fixed, familiar location. This time proven concept is a Convenient-and-Efficient Alternative to the Dedicated-Octopus Second Stage. Reduce your Rig by One-Hose with the High-Performance Atomic SS1. The High-Flow, Low Pressure Disconnect is Interchangeable with many other Models yet smaller size and Lighter in Weight. Large Oversized and Ergonomically-Shaped Buttons are Easy-to-Find for Pneumatic or Oral Inflation/Deflation. They are Easy-to-Distinguish and Faced with Soft Tactile Rubber Surfaces. The Elliptically-Shaped Body of the SS1 Lies-Flat against the BCD keeping it Out-of-the-Way and Reducing Drag. Seat Wear is the first cause of Regulator Leaks and Performance Degradation. The Stainless Steel Dynamic Orifice is Pressure Energized and Only- Contacts the Rubber Seat when in Use Equipped with a Titanium Lever this High-Strength Metal part is the Link to your Air Supply and will Never-Fail due to Rust or Corrosion. The Integrated Purge Cover is a One-Piece Flexible Cover allows Purge of the Regulator when Depressed anywhere on the Cover Surface. The SS1 has Titanium Inflation/Deflation Stem, Demand Valve Body, Stainless Steel Orifice and Springs and a Titanium and 316-Grade Quick Disconnect. The Mouthpiece and Diaphragm are Silicone Rubber and the SS1 Body is manufactured from Fiberglass Reinforced Nylon. The SS1 is a Dependable Downstream Demand Valve Design. The SS1 weighs 6.3 oz (180 g) without the Hose and the Hose also weighs 6.7 oz (190 g) and measures 28" (71 cm) in length. The SS1 comes with an Owner's Manual and is covered by a Limited Lifetime Warranty.